1984. LPA held their first Clout competition at the Alma Road Girls School in Sidcup. For the benefit of new members a clout shoot is a re-enactment of battles we fought and won against our neighbours across the English Channel. The arrows are shot upwards instead of horizontal. 1995-2002. Friendly matches took place at home and away with "Atkins" and "Grays Power" using dartboard faces. The club also competed in the Darenth Valley League. 1998. 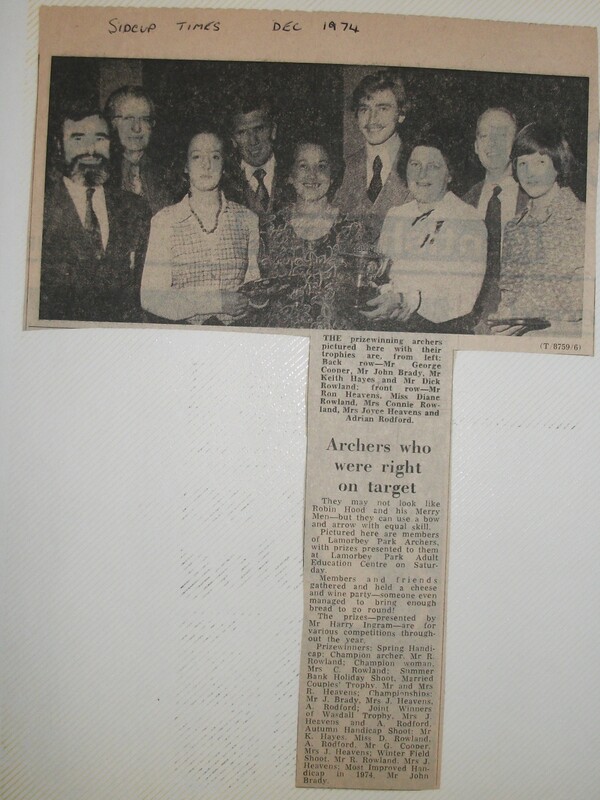 The club celebrated its 40 years of archery with a special event followed by refreshments. The chairman at that time lamented the loss of many documents due to an arson attack. Two club archers were recognised for their achievements. 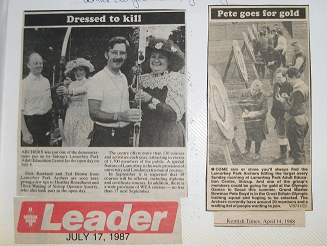 Jane Brent became the first Kent archer to achieve Grand Master Bowman status and still holds 2 County Records. Peter Boyd also achieved GMB status and was Southern Counties Champion 4 years in succession. He made the Olympic squad and competed for England in many countries. His 9 County Records for recurve freestyle are yet to be broken. 1999. The Clout competition relocated to the grounds of Eltham College until 2016 when the campus underwent alterations. 2000. Our club membership totalled 26. 2000/2003. E-mail competitions were arranged with the Paringa Achery Club in Tasmania. 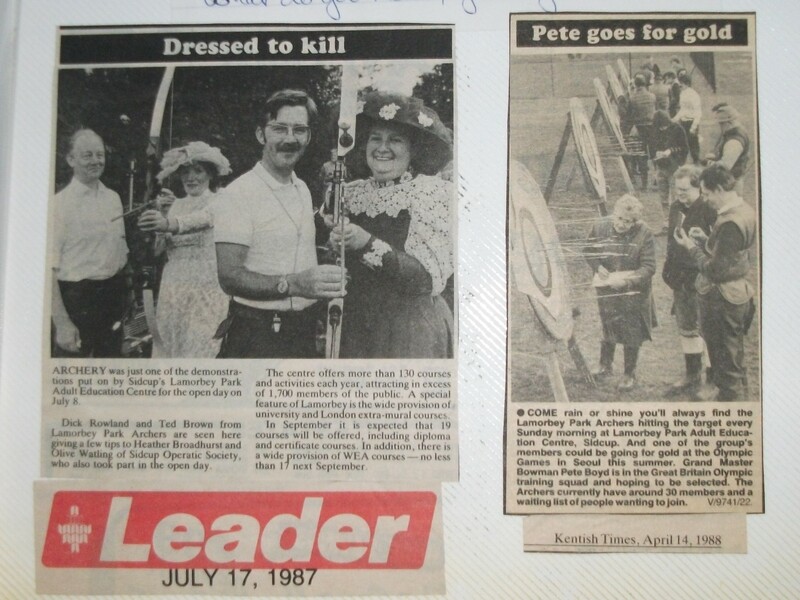 It was shooting at this club that our club captain Carol Parkinson got the archery bug. 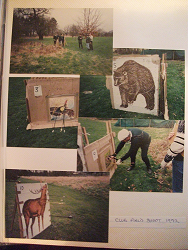 The editor of the May newsletter was seen to be using a mobile phone behind the shooting line. A very senior club member pointed out that the editor should know better. A humble apology was then made. 2008. The club celebrated their Golden Anniversary by arranging an open competition. The shoot consisted of a double Warwick round. The second round was shot in reverse order. The club range moved to its current location due to developments on the college grounds. Classifications achieved by the members totalled 18. 2012. Our membership totalled 100 mainly due to the interest in the London 2012 Olympics and the release of the film Brave. Today the figure is much more manageable. The clubs Longbow archers started a long run of successes competing in clout type events hosted by the Fraternity of St. George. 2017-2018. The Knights Challenge competition was held in lieu of our clout shoot. 2018. As at January LPA junior archers currently hold 58 county records. Mrs. Coombes, Mrs. Stockbridge, Mrs. Moore, Miss D. Eaton, Miss E. Eaton, Miss Law, Miss Moore, Miss Nicholls, Mr. Coleman, Mr. Coombes, Mr. Davie, Mr.Fryatt, Mr. Shellett, Mr. Stockbridge, Mr. Tunis, Mr. Ingram, and Mr. Moore. Absent were Mrs. Ashdown, Mrs. Bunton, Mr. Bunton, and Mr. Bowler. Annual subscription was 15 shillings (75p) due on April 1st. 2 shillings and six pence (12 1/2p) was paid to the centre at Lamorbey Park. The 1st years AGM was held in March 1959 where only nine members attended. The income was £15 and expenses were £23.05. A £10 loan was applied for payable over 2 years. The first Chairman was Mr. Ingram, the Captain was Mrs. Moore, Secretary was Mr. Moore, treasurer was Mr. Stockbridge and the president was Mr. Eason. The Club Captain reported to the AGM her disappointment at the poor turnout at shoots with only 8 out of 19 members attending. Also it was suggested, but not agreed that the Club captain should be the best archer. Minutes of Meeting of the Committee Held at the Centre on Friday 29th May 1981 at 7.45 p.m.
Minutes - The minutes of the meeting held on Friday 24 April 1981 were agreed and signed as a correct record. Invicta Coaching Group - The chairman reported that the group needed accommodation on Sundays and we could not therefore help them. 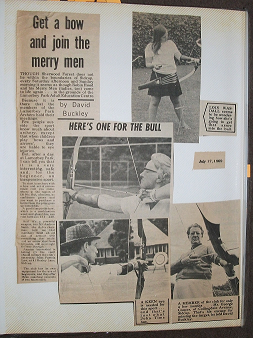 Secretary's Report - Welling Round Table - It was reported that a phone call was received from the secretary of the Welling Round Table enquiring whether the Club could give an archery demonstration to their members and also let them "have a go". 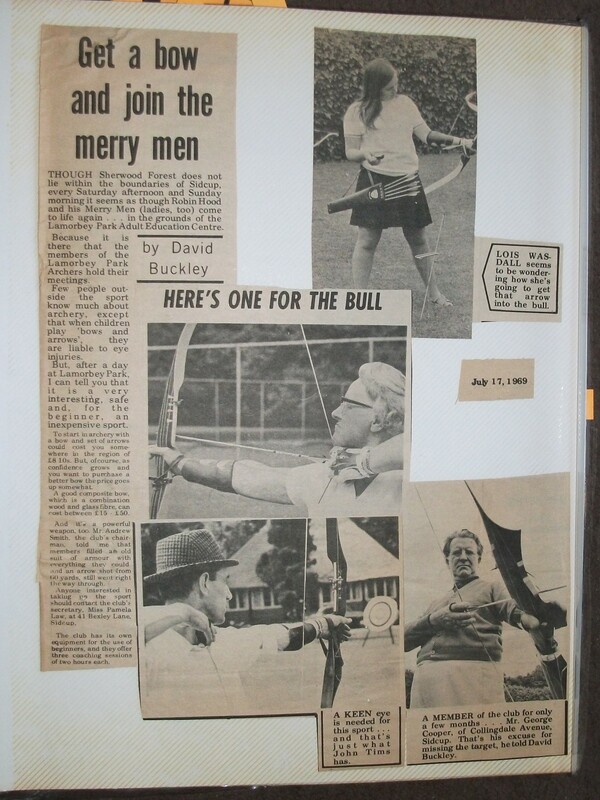 The Committee agreed we could meet this request and the Club Captain offered to give a short talk on the history of archery if required. The Secretary would arrange a suitable Tuesday evening. Sidcup Times - A reporter of the Sidcup Times had contacted the Secretary for details of how the recent weather had affected archer for an article he was writing covering the effects of the weather on local sport. Membership Applications - There were no membership applications to report. Correspondence - An appeal was received for street collectors for the Help the Aged flag day on 18th July. Club Captain - Mr Brown had nothing to report. 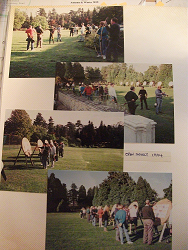 We had eventually shot the Western round against Eltham, New Zealand on the 25th May. NEWSLETTER - The Chairman volunteered to edit the next newsletter. Lady Paramount - Mrs E Vincer had agreed to act as Lady Paramount. Guests - Mr & Mrs Nicolle regretted they would be unable to attend the twilight shoot as they would be in Iceland at the time. Any Other Business - Safety - It was reported that some members had been shooting on an evening recently while people were passing. It was agreed members be warned in this connection in the next newsletter. Date of next meeting - The next meeting of the Committee was arranged for Friday 3 July 1981 at 7.45 p.m. There being no further business the meeting was declared closed at 9.30 p.m.